Before i left for swansea i bought some new boots from primark my new ones are military style boots, but i felt i couldn’t get rid of my old boots from primark, so i decided to chop of the straps along the front and turn them into lace up boots. My brother is a trainee saddler so he works with leather and makes belts handbags and shoes, so he was the first person i turned to for help. 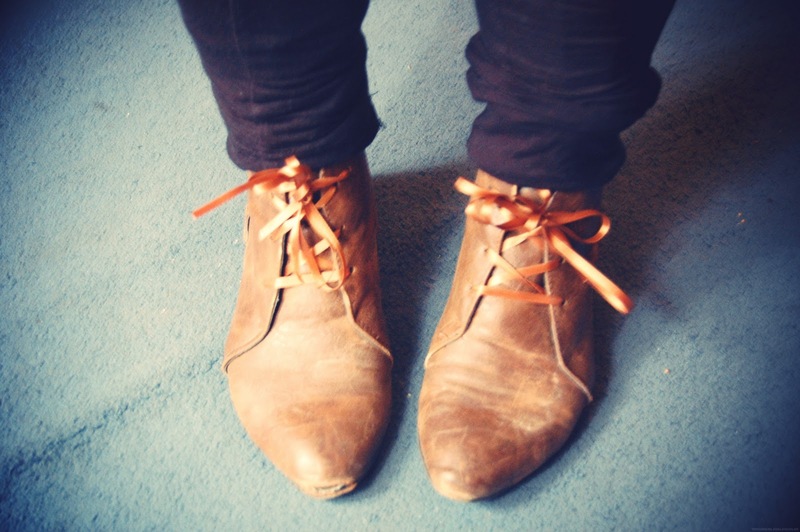 We basically cut the straps off the front and decided were i wanted the lace holes to go, he used a leather sort of hole punch and made the holes, the next stage was to find the perfect laces i found some wonderful vintage ribbon in the market at swansea. I know they have a little hole at the front but i am in the process of gluing them, i love them. Ah they're lovely! I wish I knew someone talented like that. Oooh, great way to restore them! I love the ribbon (: Very pretty. Hope you enjoyed your trip to Swansea. My Aunt used to have a shop in the market. You can find everything in there! how ace. pretty neat idea. have you considered making badges with the fishermen on them?